Is this warrior worth building up? I like the traits and I pulled it as a gold so nothing invested at the moment. Should I wait for that "perfect" warrior? That's a damn good warrior. Strong increases base damage, which is then multiplied by any additions like %damage badges or ruthless on armour. Retaliate is a great warrior trait, given that warriors constantly risk attack by anything they didn't kill. I'd be happier if the warrior had Iron Skin rather than Dodge, but that's a damn good warrior. I truly hate to say this, because in 9 months I haven't found one, you have what I'd call a "Damned near perfect warrior" on your hands right now. I don't know many that would give her a pack of rations and send her away. Make room around your campfire, pour her a cup of the home made brew, and welcome her with open arms before another outpost gives her a better offer! I have almost the same, lucky instead of strong. And i neither level up nor scrap for now. Imo dodge, iron skin and retaliate are musts. A warrior will take damage. Thanks for the info! I rarely if ever used warriors cept for the heroes, so I had no idea. Didn't read anything above at all. But I still feel qualified to answer. A perfect warrior/scout doesn't exist IMO. 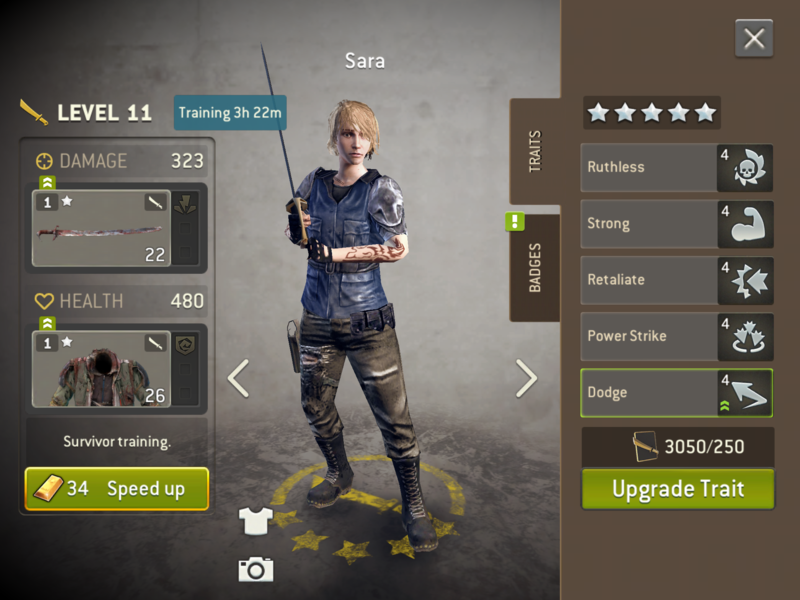 Mainly because I would need NG to let me have 7 traits as a one off, the 5 Sara has plus iron skin and lucky . But this is as close as you are likely to get! Agree with the messages above, you will need a few damage reduction badges and iron skin armour to or else she will 1-hit struggle whenever you get to a remotely challenging level. Warriors are definitely useful for some of the distance missions, even if you only use ranged for the toughest levels. I often use two warriors and an assault to get through the levels with armoured; the warriors take care of the zombie cops and the assault helps cope with the spawns. Gate crashing: Michonne + Scout (preferably with TR weapon) + Warrior. With that combo, the spawn meter is usually entirely empty, giving me all the time in the world to line up the two warriors to be in the right position when the scout pushes the gate along. It's soooo much more relaxed than using ranged. Good neighbours: Same story as above. Lock In: A warrior can stand between the two fences and take out the whole spawn group each turn. Yard Work: Despite there being no spawn meter in Yard Work, I prefer to use melee because it's such a crowded board and it's not easy for ranged to find safe places to stand. By the toughest levels I'm using Morgan, a scout and a warrior. So there's a few things you use them for. I'm looking forward to the next time Ka-boom comes round so I can try Michonne and a couple of TR scouts in Fuse Box (hadn't unlocked her last time). You do need gear with Wide Arc. Without Wide Arc, it's very tedious waiting for the walkers to form a nice straight line. I definitely commend you on your memory retention, or note taking. I hardly remember some maps from one RSL level to the next! Don't ya be forgetting bruiser's with concussion!